At Magsol, we tend to the philosophy that the best personal care products are made with all-natural, proven, state of the art ingredients carefully selected with meticulous study and uncompromising approach to science . All our products are always devoid of artificial coloring, artificial fragrances and dangerous hormone disruptors. We formulate our products to be compatible with even the most sensitive skin types through careful pH control, exclusive use of non-comedogenic ingredients (all ingredients rank 2 or lower on pore-clogging rating scale of 0-5) and exclusion of any ingredients that are potentially caustic to the skin. 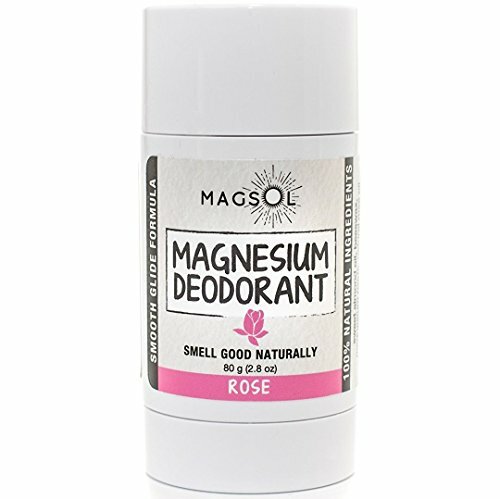 Our 100% all natural magnesium deodorant is made with only 4 ingredients - non-comedogenic sweet almond oil, pure food grade magnesium oxide, beeswax, and therapeutic grade essential oils, All ingredients were selected to maximize functionality - eliminate odors, enhance physiology, and eliminate skin irritation, Magsol magnesium deodorant is formulated to be naturally compatible with your skin yet effective so you can smell good naturally. Sweet almond oil is a base oil in all our deodorants and lotions due to its natural abundance of anti-oxidant rich Vitamin E, Vitamin D, Vitamins B and Vitamin A. Additionally, Almond oil is non-irritating and non-pore plugging compared to other oils commonly used in skincare and cosmetics. FREE of everything you don't need! We stand behind our products, so please contact us anytime! If you have any questions about this product by MagSol Organics, contact us by completing and submitting the form below. If you are looking for a specif part number, please include it with your message. MenScience Androceuticals Advanced Deodorant, 2.6 oz. Lavanila The Healthy Deodorant-Pure Vanilla-2 ounce.